Simon & Schuster, 9780671787387, 304pp. Patrick O'Neil is a travel agent who never goes anywhere. His closest confidante, Sharon, is chain-smoking her way to singles hell, passing up man after man. His parents, proprietors of a suburban men's store whose fortunes are sagging more visibly than its customers, can't agree how best to interfere in their sons' lives. And his lover, Arthur (a nice golden retriever of a guy to whom Patrick can't quite commit), wants to cement their relationship by buying a house. Then a call comes in the middle of another sleepless night. Tony, Patrick's straight-as-an-arrow younger brother, has fallen in love with a beautiful lawyer who is turning him on to...opera. Unfortunately, she's not the woman he's already pledged to marry. Tony's life is a mess. Finally, the brothers have something in common. Michael Dorris San Francisco Chronicle Like The Object of My Affection, The Easy Way Out is an exhilarating, entertaining, smart novel. Vivid, quirky characters leap off the page....On one level, the collisions of these men and women are laugh-out-loud funny....McCauley has a marvelous knack of selecting angles of observation that reveal more about a character than the character knows about him or herself. 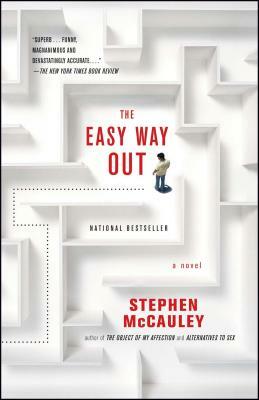 The Easy Way Out is a great story, a page-turner, very contemporary, sometimes arch, always agile....Stephen McCauley is a writer of insight, surprise, and finesse. His novel sings. Vogue Charm may be the hardest of all qualities to pin down on paper, but The Easy Way Out has it brimming from every page....McCauley has an impeccable ear for the language of family squabbles and a consummate understanding of the small pleasures and guilts that inform love. Right up to its bittersweet end, The Easy Way Out provokes numerous smiles and repeated flashes of recognition. Detroit News It's hard to resist the lovable folks in McCauley's The Easy Way Out...a wonderfully odd and heartrending collection of people, these more or less lost souls trying to figure out their lives and loves...Quirky, complicated and often hilarious, Stephen McCauley's people are, in the end, just like you and me. Read The Easy Way Out and see just how easy it is to fall in love with them.